I am waiting for a call from one of my colleagues now and then I’m finally taking a shower 😛 Why the heck does everyone believe I am their problem solver? Can I please borrow this? Can you please look at that? Do you know someone who…? Could you please ask X for Y? Hello, I already have a full-time job!!! Not that I don’t like to help and I often enough volunteer to help but only to some degree. Being chased by 5 different colleagues, assistants and their needs just overwhelms a little! And I have enough to do for myself. Yesterday I sent a mail to all my program participants telling them that their behavior regarding their attendance is not sustainable anymore. Now I am bombarded with emails and calls. Yes everything’s fair enough but if I hear 15 of these stories I just can’t keep organizing workshops. And the worst I have a few people (of course always the same) that don’t cancel but also never show up! I hate this disrespectful behavior. And I am really sorry for the other program members who really care and don’t get the workshops they should. But enough work rent done. I’m originally just popping in quickly to share one of the last bits of my half-marathon prep. Wooooah it’s t-5 days now!!! Tomorrow I’ll talk about food again! My favorites are Timber, Shattered and People like us. They make me speed up and boost my spirits. 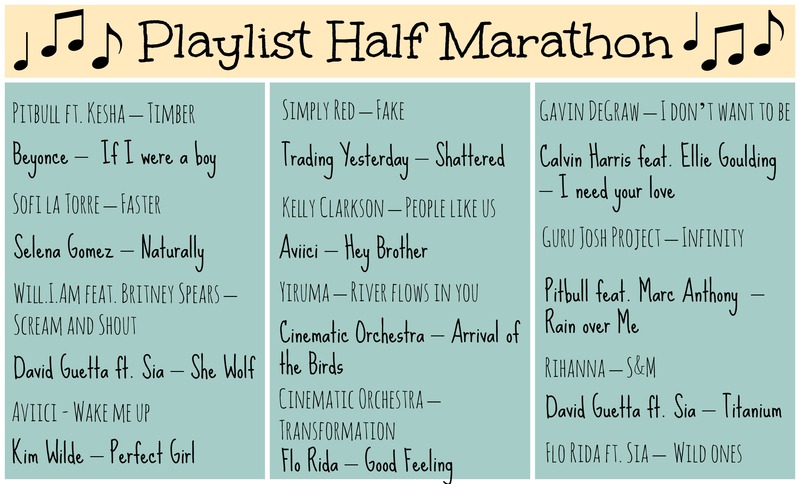 Which songs are a must on your running/ workout playlist? You, my friend, have amazing music taste- except gavin degraw. Stupid Peyton and Lucas. You should tell everyone who harasses you with questions to go chuck a pie in their faces. Thanks, buddy! Oh no Gavin is great! And don’t Peyton and Lucas end up together? I used to work in temporary recruitment where companies would ask me to organise staff to fill in for their staff from anywhere from 1 day up to 6 months at a time. So I used to always get calls and emails or actually not get calls and emails when people were sick or running late for work so I totally feel your pain on the program participants having a lot of excuses. For me after a while I didn’t believe any of the excuses I got because I couldn’t believe there were really that many people sick every Monday morning, even though there were those who legitimately were. I’m at the same point. I do not believe a single excuse! You’re sick – how handy! as if you only knew that 5 minutes before that workshop starts!!! But unfortunatelys you can’t do anything about that. So better not get too annoyed. Thank you very very much! I added Get Lucky, Burn and Bounce. Robyn is a great idea too. I will get some of her songs for my next running project! Thank you 😀 If I was anyone near running a half in under 1:15 I reckon I guess I wouldn’t need music as well. But as I am pretty sure I’ll double that time I need some distraction 😉 Thanks for the song. There’s plenty of Bastille on my playlist right now-but I’m always glad to get ideas!